If there is one pasta that goes by the most different names, (and many of them do) it has got to be cavatelli: a.k.a. cavadeel, gavateel, cavatielli, and well, the list goes on depending on where you are in Italy and the dialect spoken. Let's just say that cavatelli are the rock stars of the dry pasta world of southern Italy, especially Campania, Puglia, Molise and Calabria. Here’s an amusing fact about how seriously cavatelli are taken in that part of Italy. At one time, a bride to be had her thumb inspected by her future mother-in law. Why? Because if it appeared well used and somewhat worn, it was a tell-tale sign that she knew how to make cavatelli. Talk about pressure! Cavatelli are made from durum wheat flour, salt and water -- that’s it. They are formed like gnocchi and have a little indentation on the underside to trap a delicious sauce, be it tomato or ragu or some whimsy of the cook. 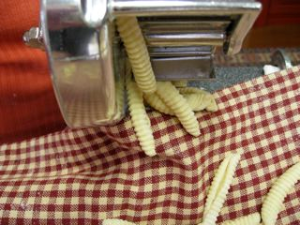 I use a cavatelli machine to make them in nanoseconds of time. But they are easy to do by hand with a butter knife. After the dough is rolled and cut into small pieces, drag each little piece across a wooden cutting board with the knife or your thumb to create the indentation. No, you won’t get the neat looking lines as in the photos below but they will taste great all the same. 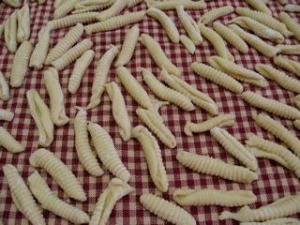 Cavatelli can be frozen for future use, and they are always on hand because no respecting southern Italian would ever be without them. Heap the flour on a work surface. Make a well with the flour, add the water and make a dough that is fairly stiff. Add more flour or water as needed. Knead the dough until smooth like bread dough. Rest the dough covered for 30 minutes then cut dough into 6 pieces and roll under the palm of your hand to create a log that is the thickness of your thumb and 14 inches long. Coat each log well in flour to prevent them from sticking as you feed them through the cavatelli rollers. As they form, place them on floured towels in single layers. To make them by hand cut each log into 1/8th inch pieces. With a butter knife draw each piece of dough across a cutting board, leaving it with an indentation and place as above on floured towels. Or just use your thumb to drag them across the board. You can freeze them on the trays and then transfer to plastic bags once hard or cook them immediately. Heat the olive oil over medium heat in a two quart sauce pan. Stir in the garlic and red pepper and cook until the garlic softens. Remove and discard the pepper. Add the tomatoes and salt and cook covered about 20 minutes over medium heat. Stir in the oregano and keep the sauce warm while the cavatelli are cooking or make the sauce ahead and re-heat when needed. Can be frozen. Cook 5 dozen cavatelli in 4 quarts of salted water. While the cavatelli are cooking, place the ricotta salata in a shallow serving bowl or platter. Add 2 tablespoons of the cooking water from the cavatelli and mix well with the cheese. Drain the cavatelli and add to the bowl with the cheese. Add the sauce and mix well. Serve hot! Recipe for 5 dozen cavatatelli serves 4 as a first course. It's so funny what an influence pasta has on...Well its hard to explain.. taste? For some strange reason I find pastas like cavatelli much more appealing that say, spaghetti. Maybe its the fun shapes and ridges, who knows? Surely your pronouncement about the flour and water only nature of cavatelli doesn't exclude the ricotta and semolina version from your first book. I have been making them for years and everybody loves them! Jeffrey, nice to hear from you! The original cavatelli were only flour and water but over time, as with any recipe, variations were adapted so yes, the ricotta and semolina cavatelli are delicious too. So I hope you will try these too. I love having a machine to make them. I used to make each one by hand like the directions in your first book. Boy, were they a labor of love that way! 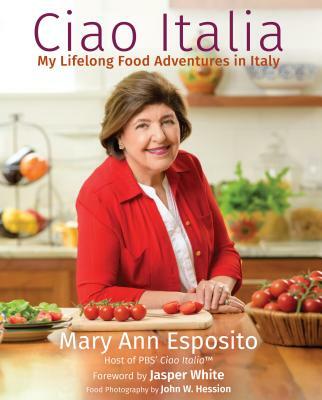 Thanks for all of the great stories and recipes! Hello. Can you tell me where I can purchase this machine? I live in the Philadelphia, PA area.